Real. Powerful. Inspiring. Tough. Rising to Power provides a perspective on leadership that is easily relatable while being equally as challenging. If every management book could be this straightforward the leaders running the companies of today and tomorrow would be positioned for greatness! Having watched many leaders rise to executive levels of organizations and struggle to meet the unforeseen demands those roles bring, I believe Rising to Power is a timely and impacting roadmap by which leaders can successfully ascend to executive ranks, and make powerful contributions once there. For leaders aspiring to top level roles in their organizations, I strongly suggest reading this first, and raising your odds of success. In a sea of leadership sameness, Carucci and Hansen have emerged with a disruptive view of what modern-day executives should look and act like. Anyone who humbly occupies an executive leadership seat and desires to build a legacy of sustainable results must apply the lessons of this book. Do yourself, your shareholders, and your associates a favor—make the change today. Rising to Power is a time tested, wisdom-packed guide for executives desiring to be exceptional leaders as they navigate their ascent to the highest levels of their organization. Nearly two-thirds of all leaders entering executive roles lack sufficient understanding of what is required and are unprepared for what they will face, which explains why 50 percent of them fail within the first eighteen months. For decades we have known that failure rates among transitioning executives are too high, causing exorbitant costs, damaged organizations, and stalled careers. Still, little has changed in the way organizations prepare leaders to assume executive positions. Three-fourths of new executives say their organization did not adequately prepare them for the executive office. It doesn't have to be this way. If you are an executive--or you're aspiring to be one--and considering how you will navigate the ascent in your organization, Rising to Power will serve you like no other resource can. Odds are high you have watched a promising executive fail on their way up. Like many, you scratched your head, wondering, ''Why didn't they see that coming?'' Now you're hoping not to be the next one that falls. Rising to Power will guide you on a predictable journey of ascent, through the transitional moments and issues most common in executive failure. It will bolster your confidence, open your eyes, deepen your insight, and if you let it, reveal your own proclivities for failure that you may not even recognize. 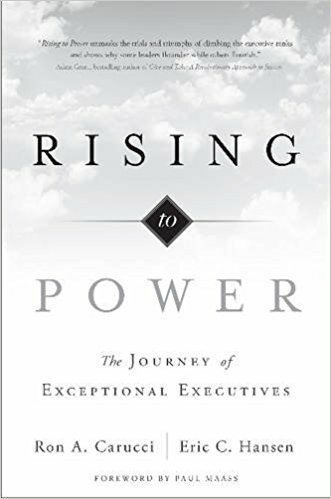 Based on a ten-year longitudinal study, Rising to Power offers a profoundly new way of looking at an executive's rise in an organization, and offers an approach to significantly increase your odds of success.